CHESTERTON | A historic Indiana Dunes-area mansion, in such poor condition some feared it would be torn down, has been completely redone and now is open. The mansion now is a boutique hotel – a site for weddings and other events. 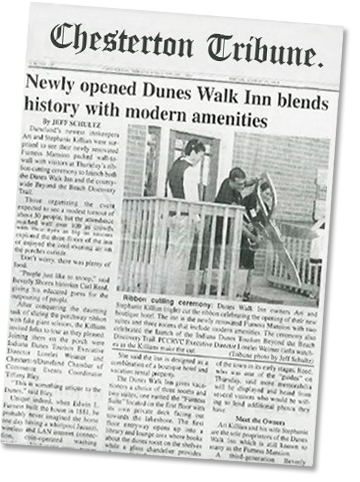 DunesWalk Inn at the Furness Mansion, which had its grand opening Aug. 26, features three rooms and two suites for those who want to get away for an overnight stay, a weekend or a week at the Dunes. It’s located just off U.S. 20 at 1491 N. Furnleigh Lane, near the Schoolhouse Shop. Chicago resident and contractor Ari Killian, whose family has had a summer home in Beverly Shores since the 1940s, said he was driving past the three-story brick mansion last year and saw a for sale sign. He envisioned an upscale yet affordable place for individuals or whole families to stay that’s just minutes from the Dunes. He bought the building and, in January, had his company, Consortian Construction, set to work restoring it – keeping all four exterior walls and salvaging interior pieces such as the decorative air vents and the staircase. He then reconstructed the interior with new plumbing, electrical, walls and floors. The rooms are insulated to minimize noise and feature private baths and individual climate control systems. The inn has flat-screen televisions in each room, kitchenettes in all but one room and coin-operated laundry service. One of the suites has a fireplace, whirlpool bath and accommodations for six; the other suite sleeps five and has a deck and fireplace. Killian said his wife, Stephanie, chose the palette of interior wall earth tones for a “dunes feel” and also picked the countertops and the shower materials.